Read the full interview, translated by goldpanner! --It's been almost 17 years since Kingdom Hearts released on March 28 2002. And, in Kingdom Hearts III, we have come to a point of punctuation: the end of the "Dark Seeker Saga," which has lasted for these past 17 years. The worldwide release of KH3 was a success, with over 5 million units sold. Having received such a large response all over the world, please tell us what you're feeling about getting here. --There's a form that appears called "Rage Form," which reminds us of the "Anti Form" from KH2. What is the setup behind that? --There's no "Critical Mode" difficulty level in this game. Was there a reason you didn't include it? --Among the worlds, we felt that the plot in the Big Hero 6 world had rather daring plot developments. Most of the worlds in KH3 were new to the series. Can you tell us which world's story left the deepest impression on you, or any stories from development? --There are several Organisation members whose original names are still unknown. Will we have a chance to learn them someday, or to find out about the scar on Isa's face? --The process behind reviving Ventus and Roxas was fairly easy to understand, but how was Xion brought back, and how did she end up in the New Organisation XIII? --Many people who have finished KH3 are interested in the "girl" that Lea and Isa were looking for, and the existence of the "NAMELESS STAR" in the Final World. Can you give us any kind of hint about the truth behind these girls? Are they characters who have already appeared in the series? --What is Scala ad Caelum, the place which also appeared in the final trailer? It looks similar to Daybreak Town from Kingdom Hearts Union Cross - is there some kind of connection? Also, who were the black-clothed figures that appeared there? --Please give us a comment, if you can, regarding the post-release download epilogue and secret movie. We are interested in the existence of Yozora from VERUM REX, who also appeared in Toy Box. --Finishing KH3 got us even more interested in the plot of KHUX. Please tell us what is in store for us there. --Please tell us about your plans for post-release updates and DLC. Is there the potential for something like a Final Mix? What is coming next in the Kingdom Hearts series? --Sky Tree, the Ambassador Hotel, Square Enix Cafe, Walkman, and the upcoming concert world tour: KH3 has certainly been showcased through a humongous number of channels. Which were most memorable to you? Is there anything else still to come? Thank god he's expanding on Xion's subplot in DLC. Sounds like we'll be getting a few free updates, if i understand him right. That's cool. I wonder what those will include and what the difference between the updates and DLC will be. Honestly, I'm mostly hoping that the dlc will finally make Kairi playable, that's one of things that upset me most. Tell me how Isa got his scar darn it! Nomura: I think it's possible to figure it out for yourself. However, I do plan to explain it in DLC. Ha! So you admit it's not! So Nomura pretty much confirmed that Subject X is Skuld. Nomura has no desire to explain Isa's scar? That's odd considering he showed how Eraqus and Braig got scarred. And its X shaped which makes it all the more significant. Well then, time to expect some Kingdom Hearts III news for D23. The secret reports literally state how certain characters were able to be revived, I don't understand peoples confusion here. If anyone needs further contextualisation through DLC, it's Roxas. I'm sad we have to wait so long till we see Skuld and Strelitiza in HD. Everyone and everything needs further contextualization, but Nomura will slap an exposition Band-Aid over one or two mysteries and call it a day. Fully expect the DLC about Xion not to feature Xion. All this plus the KH3 Ultimania releases tomorrow. What an informative time to be a Kingdom Hearts fan! I canâ€™t wait to found out more about the black box. Good thing I'm not the only one who noticed, due to great sales of KH3 the series will likely have another big game whether he was involved or not. Maybe he's thinking of leaving Square Enix in the future? I hope not (not until he finishes KH at least). Also it is low-key ridiculous we don't have all of the somebody's names yet. Nomura has already confirmed this won't be the end of the series on a number of occasions though, so I wonder if he's just being coy here or if PR told him to stop announcing things before they tell him to announce things. After all, Nomura may have a plan for another KH game, but who knows what SE (and Disney) have in mind. 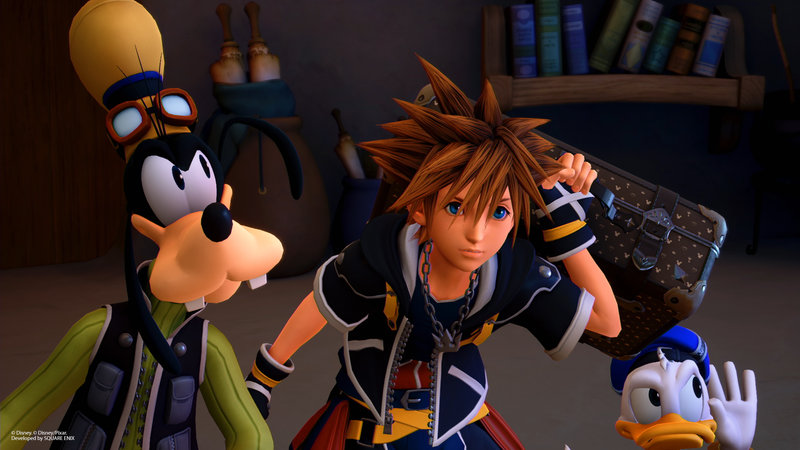 Based on what it seems like, there won't be another Kingdom Hearts game for a long time which was honestly expected. Considering Nomura is supposed to go full throttle into the Final Fantasy VII Remake, I think that will take precedent over any KH tile (or any Square game). I didnâ€™t need Critical with KH2 because most of KH2â€™s battle options were useless (especially Drive forms). Proud was enough for me. KH3â€™s options are much more fun to use, so Iâ€™m actually up for trying Critical here!